For Apple watchers, being able to look at how many devices Apple has sold in a given quarter can be a valuable way to gauge the company’s performance, and those numbers can be helpful when trying to figure out if Apple’s strategies are panning out. Those days are sadly over. At the end of his prepared remarks during the company’s Q4 earnings call, CFO Luca Maestri said Apple would stop reporting sales of its devices — iPhones, iPads, Macs and all — as of the December quarter. In other words, Apple is done talking about how much hardware it sells completely, and it seems like this change is going to stick. Maestri went on to note that these limited views of Apple’s overall business are “less relevant today than it was in the past,” because strong financial results follow as the company continues to “enrich people’s lives” and “provide an unparalleled customer experience.” Even better, Apple CEO Tim Cook ending this quarter’s earning call with an odd metaphor about grocery stores and how many “units” you have in your shopping cart. That’s, uh, great and all guys, but with that, the world’s most valuable company just became even more inscrutable. Then again, Apple has never been the most transparent when it came to device sales anyway. For years, it has dutifully reported sales of Macs and iOS devices, but the Apple Watch, Apple TV and HomePod have never been broken out on their own. That’s especially surprising when you consider just how much success Apple has found in its wearables business — earlier today, it pointed to a 50 percent lift in Watch sales. While no one at Apple has shed any more light on why the company made this decision, it’s not hard to imagine why this tech titan stands to benefit from less clarity. Just look at its most recent earnings report: iPhone sales basically didn’t grow at all compared to this time last year, and the company’s stock price took a big hit in after-hours trading as a result. The thing is, Apple made more money off of that same number of devices, so Maestri isn’t wrong that unit sales don’t always directly correlate to the company’s health. Fine, but there’s no denying that this move simply doesn’t look good, and one has to wonder what factors were being considered behind closed doors. At least one thing is clear right now: in trying to distance the idea of overall wellbeing from the number of gadgets it moves every 90 days, Apple is setting itself up to face dramatic pushback from investors. 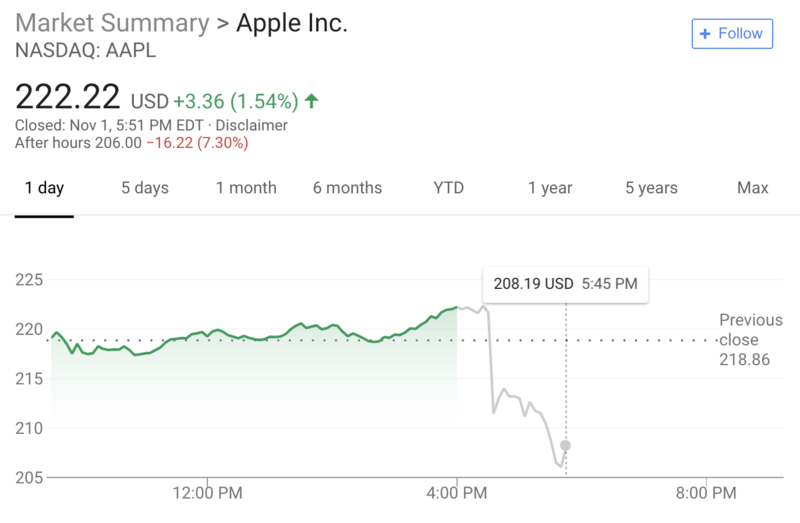 Case in point: At time of writing, Apple’s stock price is down nearly 7 percent, though it’s now currently on the upswing.